Our poll in December 2015 showed that 46% of Americans approve of Barack Obama’s job performance – a rating that’s been steady throughout 2015, and is up 4 percentage points from a year prior. Digging deeper into job approval ratings reveals additional insights about the public’s views of its leaders. We looked at Pew Research Center data going back to Bill Clinton, and Gallup data going back to Dwight Eisenhower. These ratings reflect, for example, how views of presidents have become more politically polarized, as well as how key events in U.S. history have helped shape positive and negative views of our commanders in chief. 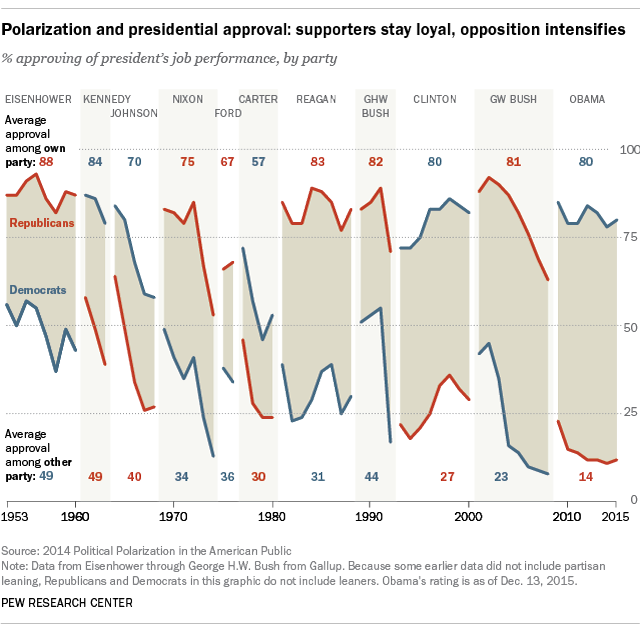 1Views of the president among members of the opposing party have steadily become more negative over time. Our 2014 report on political polarization documented this dramatic growth in partisan divisions over views of presidential job performance. Over the course of Obama’s presidency, his average approval rating among Democrats has been 80%, compared with just 14% among Republicans. During Eisenhower’s two terms, from 1953 to 1960, an average of 49% of Democrats said they approved of the job the Republican president was doing in office. During Ronald Reagan’s presidency, an average of 31% of Democrats approved of his job performance. And just over a quarter (27%) of Republicans offered a positive assessment of Clinton between 1993 and 2000. But the two most recent presidents – George W. Bush and Obama – have not received even this minimal level of support. 2 Obama’s 46% job approval in December placed him between George W. Bush (30%) and Bill Clinton (55%) at similar points in their second terms in late 2007 and 1999, respectively. It was also comparable to Reagan’s rating of 49% in December 1987. 3High-profile presidential scandals don’t always cause huge or lasting drops in public approval. Clinton first reached his all-time high job approval of 71% in our February 1998 poll, amid the Monica Lewinsky scandal. Clinton again reached the 71% mark in our late December 1998 poll, after his impeachment by the House of Representatives. Reagan’s approval rating dropped to 49% in January 1987 during the Iran-Contra scandal, but he left office two years later with a 63% rating. But Richard Nixon’s approval declined steadily throughout the Watergate scandal. His rating reached a high of 68% in January 1973, following his re-election, but plummeted to a low of 24% by the time he left office in August 1974. 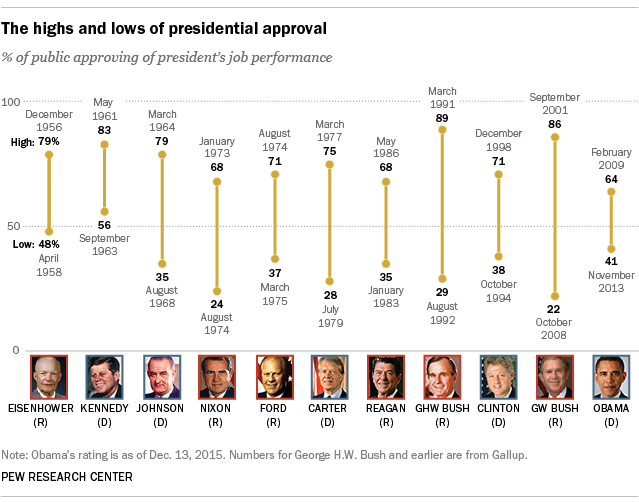 4The presidents with the starkest gaps between their highs and lows in job approval are George W. Bush and his father. George W. Bush’s 86% high came soon after the Sept. 11, 2001, terrorist attacks, a moment of national unity. 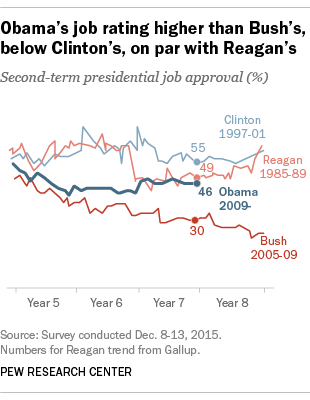 But near the end of his presidency in 2008, his approval fell to a low of 22%. The elder Bush’s approval reached a high of 89% in March 1991, following military action led by the U.S. to reverse Saddam Hussein’s occupation of Kuwait; his low rating of 29% came in August 1992. But his approval rating rebounded to 56% by the time he left office in January 1993. Note: This is an update to a post originally published on Feb. 16, 2015.